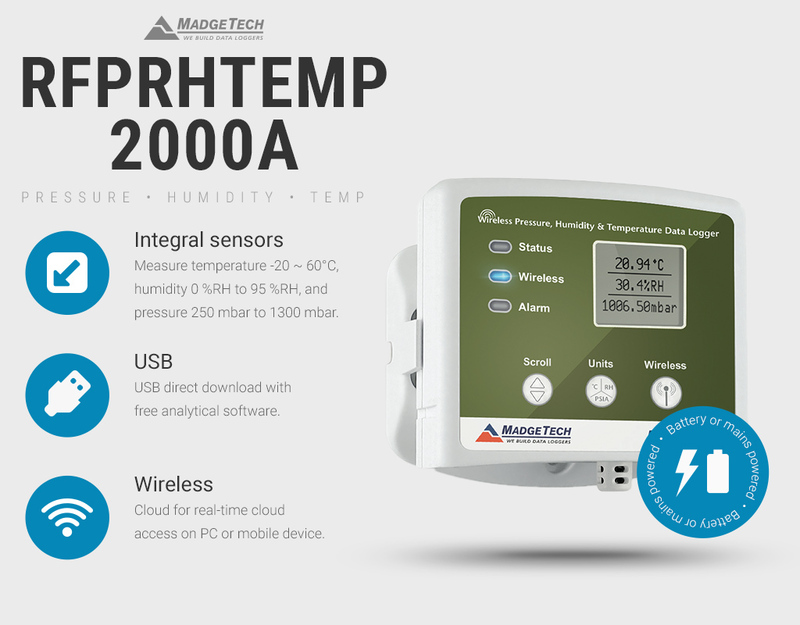 MadgeTech data loggers deliver an unrivalled array of measurement parameters including temperature, humidity, pressure, voltage, current and shock all controlled using one powerful software utility. Browse a range of MadgeTech temperature, pressure and voltage data loggers here. Browse a range of quality MadgeTech USB data loggers loaded with practical features. They can be plugged into a USB port or via a wireless connection to an RFC1000 radio receiver. Use with MadgeTech data logger software for elapsed and real-time configuration, analysis and reporting. MadgeTech Cloud services are also available when you need to access your data or an internet enabled device. Find MadgeTech USB data loggers with wireless radio here. Self-contained, compact, battery powered data loggers, boasting large memory capacity, impressive accuracies, sampling speeds and resolution delivering the best specification versus size versus price . Compatible with the free MT4 and chargeable SVP 21 CFR Part 11 Compliant software utilities. Browse MadgeTech four and eight channel, aluminium battery data loggers with optional LCD display. Monitor and record temperature data collected by thermocouples, PT100/RTD temperature sensors and voltage and current sources wired into terminal blocks. Find multi-channel data loggers here. 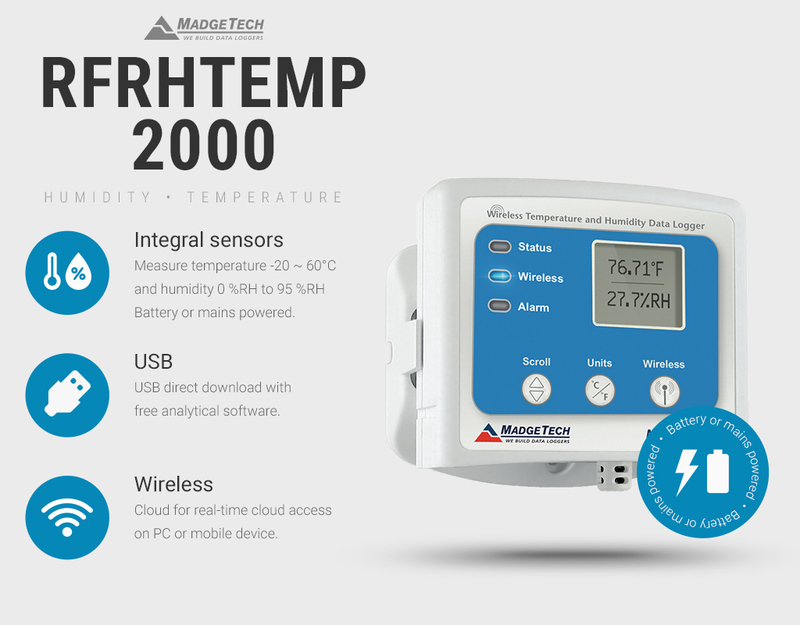 Browse MadgeTech high and low temperature data loggers with a variety of temperature probe, sampling speed and accuracy options. These MadgeTech data loggers can withstand temperatures beyond their operational limit using thermal shields and mounted in-situ with a variety of attachments. View MadgeTech high and low temperature validation data loggers here. Browse a selection of MadgeTech temperature validation data logger shields, including Teflon and stainless steel thermal shields. 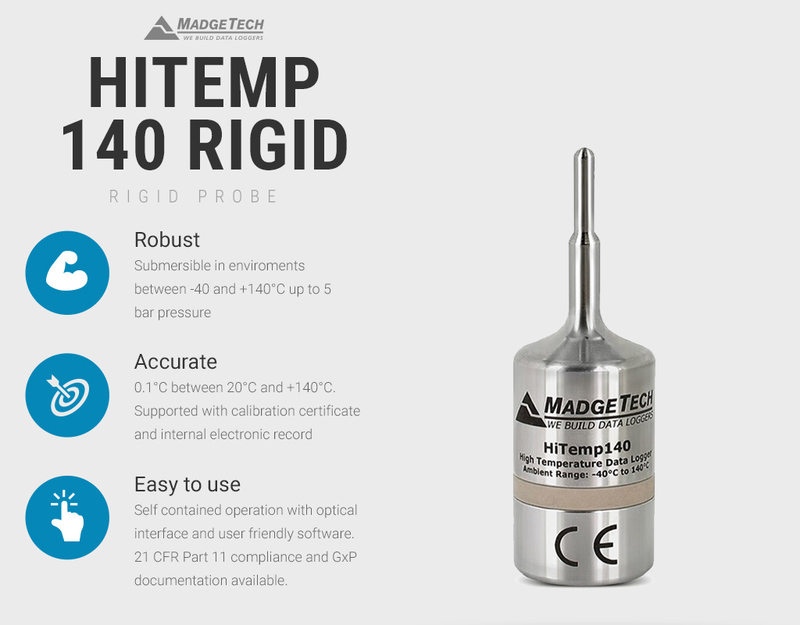 Protect HiTemp140 data loggers when exposed to extreme temperatures which enables the thermal validation of any process. View MadgeTech data logger shields here. 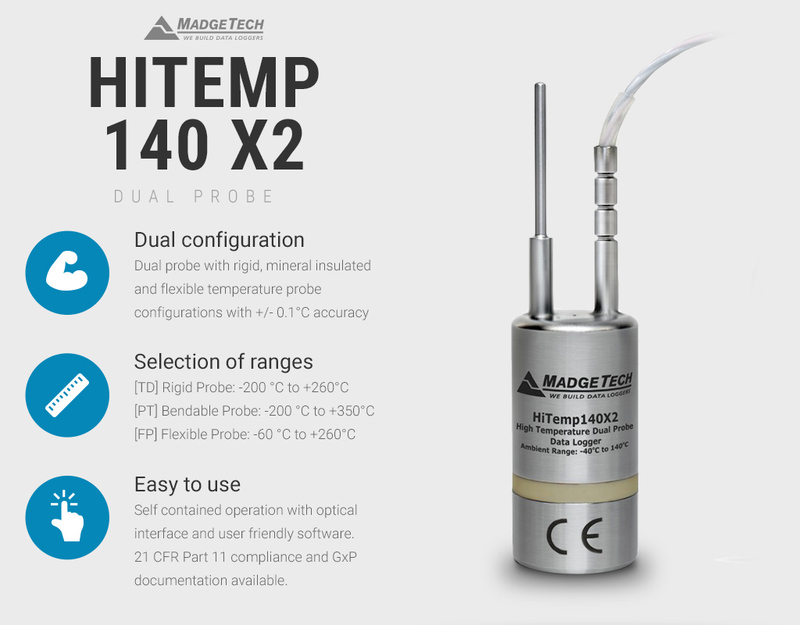 MadgeTech M12 temperature probes are compatible with the HiTemp140-M12, a precision data logger fitted with an M12 socket. Together they deliver a high level of accuracy, durability and an unrivalled measurement range.  View MadgeTech data logger temperature probes here. 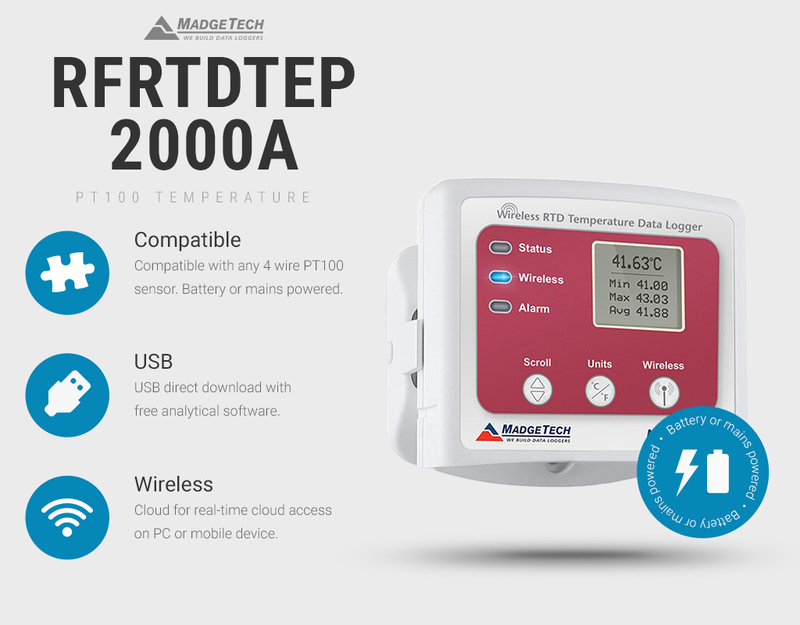 Comprehensive range of MadgeTech temperature data loggers designed to collect time temperature data within challenging applications including deep freeze, oven profiling and the pasteurisation of bottles. Find MadgeTech data loggers for the food and beverage industries including oven data loggers. Browse a variety of vibration and shock data loggers, including the TSR101 and Tri-axle shock recorders available with extended battery life and optional pressure, humidity and temperature sensors. Browse MadgeTech pressure data loggers with integral pressure transducers for collecting atmospheric laboratory conditions, pressure levels in pipework and more. 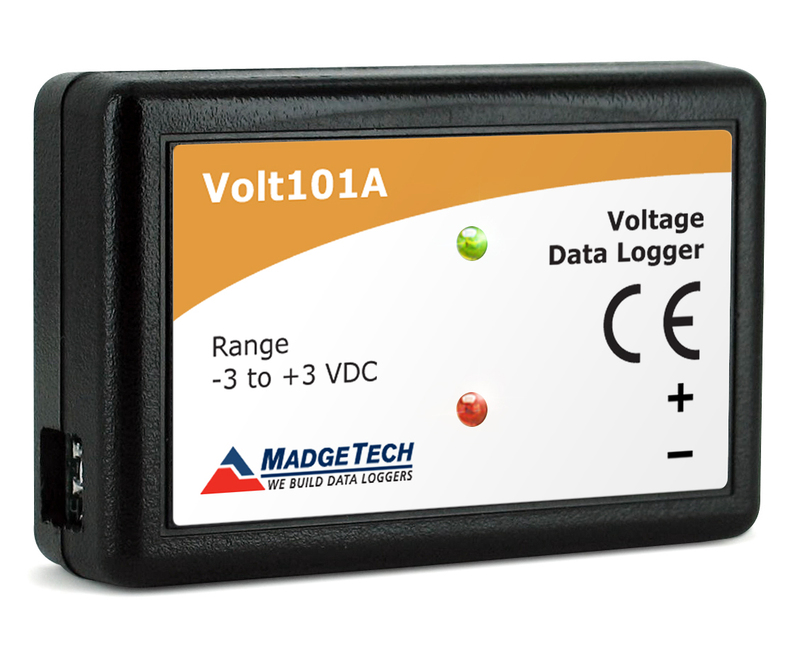 View a complete list of MadgeTech data logger software, free to download, including MadgeTech data logger data sheets and USB drivers.